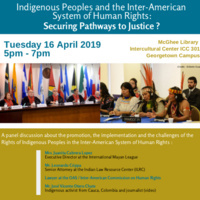 PANEL : Indigenous Peoples and the Inter-American System of Human Rights: Securing Pathways to Justice? Through a conversation among speakers coming from Indigenous organizations and the Inter-American human rights institutions, this conference aims to identify current legal and political challenges to the implementation of Indigenous people’s rights in the Americas. How have Indigenous peoples and organizations been battling to secure justice, security and recognition through the use of the Inter-American instruments and institutions? In particular, we explore advocacy strategies and diverse forms of resilience that Indigenous peoples have developed within the Inter-American System of Human Rights.